If you withdraw from this contract, we will reimburse all payments received from you. This includes the costs of delivery, (with the exception of the supplementary costs resulting from your choice of a type of delivery other than the least expensive type of standard delivery offered by us), without undue delay and in any event not later than 14 days from the day on which we are informed about your decision to withdraw from this contract. We will carry out the reimbursement using the same means of payment as you used for the initial transaction, unless you have expressly agreed otherwise; in any event, you will not incur any fees as a result of a reimbursement. We can withhold reimbursement until we have received the goods back or you have supplied evidence of having sent back the goods, whichever is the earliest. You will have to bear the direct cost of returning the goods, unless the individual product you are returning has a value of over 40 GBP, for which we will provide you with a free return shipping service, should you wish. Please contact us to arrange for your return label to be sent to you. As outlined above, your return shipment is free if the individual product you are returning has a value of over GBP 40. If your return is not free of charge, a fixed amount of your refund will be deducted to cover the shipping costs. In this case, you will be advised of the amount when you request a return shipment. These instructions only apply to products sold directly from our homepage over our website. 1. 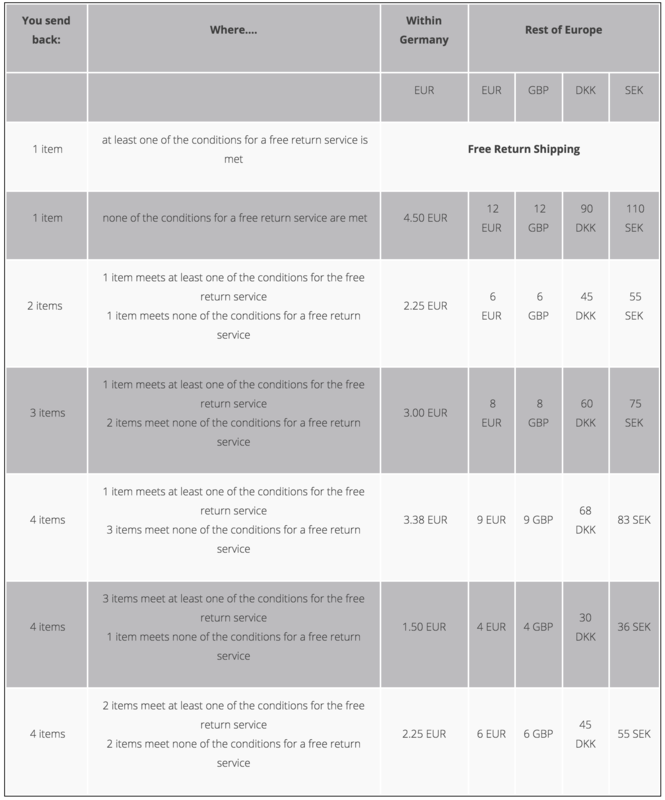 You have cancelled the purchase of an item within the scope of the right of withdrawal within 14 days and the price of the returned item exceeds GBP 40 (Note: The sum of EUR 40, GBP 40 applies to each returned item and not to the total value of the return). For more information about this please see our terms and conditions. If you have used our pre-franked return shipping label for your return. The service is free in the above mentioned cases. Pre-franked return labels, which you can print from our online returns request page, are currently available for returns within Germany and from mainland United Kingdom. Returns from these countries should be dropped off at your local Post Office once the Pre-Franked Return Shipping Label has been attached. The individual return labels are coded and are only valid for the particular return to which they were issued. Please always only use one Return Shipping Label per shipment and do not send back any products from different orders in one shipment to us. This complicates the processing of your refund. You can track the shipment process using the tracking number given on the Pre-Franked Return Shipping Label. If your return does not qualify for free shipping, a fixed amount from your refund will be deducted for the return costs. When returning goods from mainland United Kingdom the fee is GBP 12 (including VAT). When you have your receipt and the article you wish to return has a value over GPB 40, we will provide you with a DHL return label so that you can return the article to us for free. Easy. If you are returning the product within 7 days of purchase, we can offer you a full refund against the price you purchased your bag for. If you are returning your bag within 14 days of the date of purchase, we can make a product exchange equal to the value of the purchased bag. Products should be returned in the same condition in which they were purchased. They must be unused. Secondly, you can return your bag under our 5 Year Warranty. If your bag is broken due to workmanship, manufacturing or materials faults you can bring it to us for an assessment for return. We will either fix your bag, or in some circumstances, provide you with the nearest replacement. Some lines are discontinued and we can not insure a direct exchange. To ensure fast handling, please contact us, or go to your local Crumpler Shop and they will be happy to help! Nice, you picked one of our original Crumpler Shops or our Online Shop to make your purchase. Unfortunately, we need the receipt as proof of purchase to be able to take the product back, so you will have to love the product you have already bought....and next time, keep your receipt. At this stage, we can only take 5 Year Warranty returns, and return bags bought at our own retail or online shops. If you purchased your bag from our Official eBay Shop Crumpler Bags, then you have 14 days to return your bag. Simply send an email to info@crumpler.co.uk and let us know you would like to send it back. Score! That is pretty lucky, but sorry mate, as we can not guarantee the origin of this bag we can not take it back.. If you can´t prove the origin of purchase, we cannot either, so unfortunately we are unable to take the product back. Sorry for that.